NEW YORK (CNNMoney) -- The owners of the New York Mets have agreed to pay a total of $162 million to the court-appointed trustee in the Bernard Madoff Ponzi scheme, according to the federal court handling the case. Trustee Irving Picard, who is in charge of recovering assets stolen in Madoff's pyramid-style scheme, had sued the owners -- including Saul Katz, Fred Wilpon and the holding company Sterling Equities -- for $303 million. That was in addition to the up to $83 million that Judge Jed Rakoff had earlier ruled that the Mets' owners were liable in the case. The settlement was announced Monday just as jury selection was scheduled to begin at U.S. District Court in the Southern District of New York in a trial on the trustee's claim. "We believe that this is a fair and just settlement," said David Sheehan, the lead counsel at Picard's firm, Baker & Hostetler. The settlement negates the need for a court case, in which the trustee would have tried to prove that the Mets owners were "willfully blind" to clues that Madoff was operating a Ponzi scheme. "As we've said from the very beginning when this lawsuit started, we are not willfully blind, we never were, we acted in good faith, and we're very pleased this settlement bears that out," said Wilpon, in a prepared statement. The Mets' owners were among thousands of investors who had invested in the Madoff's Wall Street firm, which was a front for his Ponzi scheme. As part of the settlement, the trustee will now consider the Mets owners' claim that they lost $178 million to Madoff's scheme. The trustee's firm released a statement that the Mets owners "will be entitled to recovery on the same basis" as other Madoff customers. The trustee has sued hundreds of investors who allegedly profited from the scheme, even though many of them -- including the Mets' owners -- deny knowing that it was a scam. The figure of $162 million represents six years of "fictitious profits" that the Mets' owners made as a result of investing in Madoff's firm, which was a front for a massive Ponzi scheme that netted thousands of victims. The trustee had originally sued the Mets owners for $1 billion, but Rakoff threw out the $700 million portion of the lawsuit last year. Madoff, 73, was arrested in 2008 and pleaded guilty in 2009 to running the largest Ponzi scheme in history. He is currently serving a 150-year sentence in federal prison. Madoff did not invest the money that investors put into his firm. Instead, he used the money to fund a lavish lifestyle for him and his wife, Ruth. They lived in a $7 million apartment in Manhattan, and they also owned luxurious homes in Florida and France. They also owned a yacht and diamond studded jewelry, all of which was confiscated by the trustee and U.S. Marshals to compensate Madoff's victims. 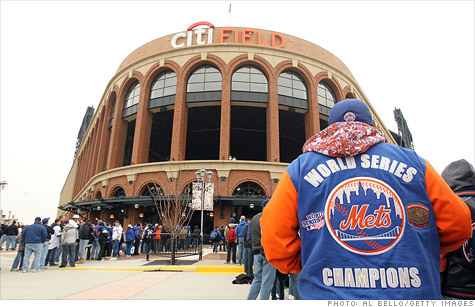 Madoff was a Mets fan, and his satin Mets jacket emblazoned with the name Madoff fetched $14,500 at auction. The trustee has recovered about $9 billion of the $17.3 billion in estimated Madoff losses. The trustee's most significant victory in recovering the money was the $7.2 billion settlement he reached in 2010 with the widow of Jeffry Picower, who may have been Madoff's biggest beneficiary. But the trustee has also had some major setbacks. In November, the judge dismissed the trustee's $19 billion suit against JPMorgan Chase (JPM, Fortune 500) and his $2 billion suit against UBS (UBS). Last month, the judge tossed a $20 billion lawsuit against an Austrian banker, Sonja Kohn, and her co-defendants. The trustee accused Kohn of funneling European investors into Madoff's firm.